When it comes to costumes infants toddlers and recent toddlers are the most fun to dress up. Although they enjoy special clothes and seeing themselves in the mirror when they’ve donned your newest costume creation, they aren’t at the stage yet where they might be embarrassed by ‘too much cuteness’ or by mommy or daddy’s slightly bizarre taste. Cute, of course, is a given. Why get a costume at all if it isn’t going to be cute. Comfy is another essential. Your toddler might not object to your taste in costumes, but he will certainly object to wearing something scratchy, too tight, or that inhibits his movement too much. If you’ve got cute, comfy costumes infants toddlers both you and your toddler are likely to enjoy it so much you’ll want it to be worn more than once—and with the way your toddler wears down his clothes, that means it needs to be sturdy too. And washable, so that you can stick it in the machine after gets the front smeared with Halloween chocolate. A costume for a little person can be as simple as a cardboard box, with one hole cut for the head, two more for the arms, and a bit of robot decoration (or book decoration, or toothpaste tube printing, or whatever is appropriate) so no one mistakes what the toddler is meant to be. It can also be as elaborate as a five-piece set of elaborately sewn, lacy queenly wearables with a pretty paper Mache crown at the top. What you decide to do with your child’s costume, and how much money, energy and time you want to put into it is entirely up to you. If you’re sewing something for your toddler or infant to wear, one useful trick to remember is to use a well-fitting piece of ordinary clothing as your model- sleepers are nice if you’re going the bodysuit costume route, or if you just need shoulder and chest measurements, go with a t-shirt. By using your toddler’s clothing as a starting pattern you can make your own costume pattern that fits perfectly and has all the right proportions. Not all of us have the time, imagination, or willingness to put up with mess that it takes to improvise a costume at home. That’s why stores abound with costumes infants toddlers and other children might find appealing. 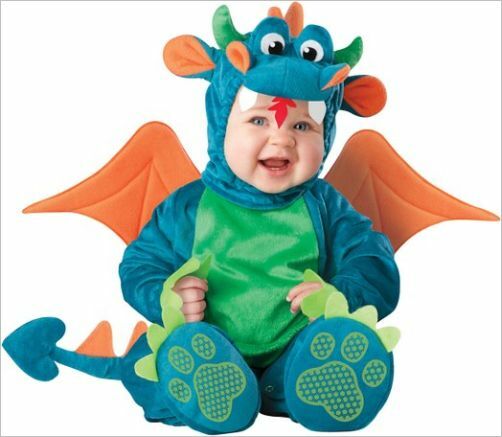 If you want a specific type of costume for your child, though, or even if you just want a wide selection to choose from, the internet is one of the best places to go shopping. There’s only one problem with buying on the internet: you don’t get to feel, inspect, and try on things before you buy them. That’s why reviews are important, and that’s why toddlers are Fun has taken the time to review a number of fun, high quality costumes that your child will love to wear. Enjoy browsing our ‘store’ pages and find something perfect for your little guy or girl!